What are the 3 things that can happen when pricing a home? In a growing market with prices climbing up particularly in the most active season in Boston traditionally – spring, sometimes there’s a fine line between #2 and #3. Incidentally we’re in that exact kind of market right now in Boston. This is a short version of pricing fundamentals discussion and why #3 makes no sense, unless you absolutely don’t care whether you sell or not. Do your homework upfront side by side with your Realtor to understand price points and competition landscape. Property’s Asking price = Educated guess on what current market is willing to pay for it. 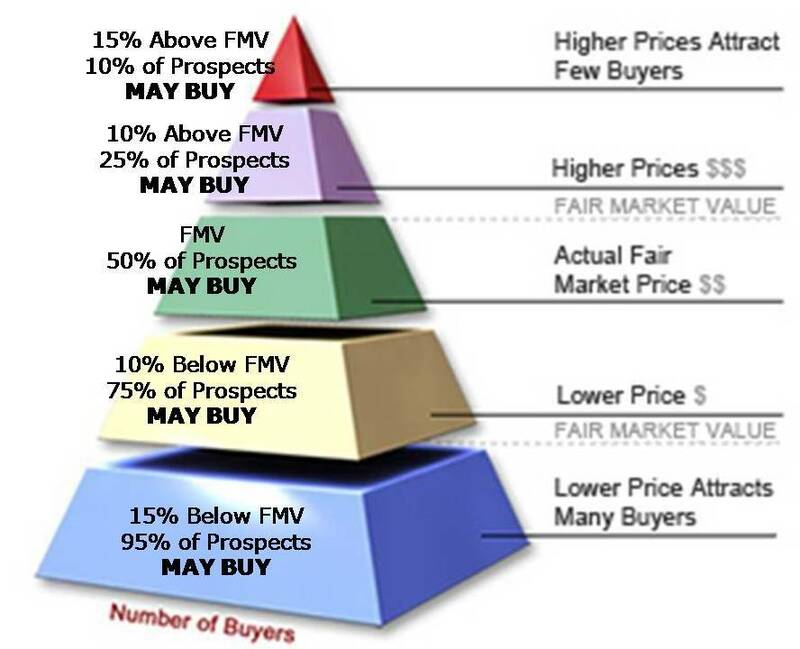 Property’s Fair Market Value = Actual price range buyers are willing to pay evidenced by offers. First things first: Review market activity with your agent from several angles including 1) price per square foot range for sold, under agreement and active for sale properties comparable in age, condition and location 2) current competition buyers will compare your property to. Secondly, review “pricing pyramid” to understand the basic psychology of the market. Another point about “overpricing” on purpose – no matter where you price the property, there’s very VERY little chance of someone offering what you’re asking. Ultimately it comes down to what a buyer can buy for their money. If they see better or similar options for less money, they’ll deduce “fair market value” on your property is around the same numbers (and so will bank appraisers if buyers will be financing). This really applies to properties in every price niche, but it’s most frequently the luxury properties that end up overpriced and sitting on the market significantly longer than non-luxury. If you already listed your property and wondering when to revisit pricing – a good benchmark is “3 weeks / 20 showings”. Don’t count curious neighbors and casual Open House goers naturally, but “3 weeks / 20 showings, whichever occurs first, is usually a point at which you can trust the market feedback. Those “serious buyers” have seen the property.